Mine included, it seems that many of the AU Unplugged sessions had a lighter turn out than expected. Even with the limited attendance, I must say my session provided a great platform for some discussion I am certainly bringing home with me. The concept of a Training Trinity is one I have not seen much (if anything published on). About a month ago I made a post centered on “Starting a CAD Standard“. I’ll paraphrase for those of you who may not have read that post. My “Starting a CAD Standard” post focused on the idea that the most important element to a CAD Standard is not the awesome DWT you have set up, it’s not the documentation (directly), not even the automated routine you may have programmed. Instead what makes of breaks a CAD Standard is the unspoken (and undocumented element). When starting a CAD Standard one must have a clear and concise goal, a mission statement even. Different elements of your CAD Standard shouldn’t be established as islands. I can assure constructing bridges between your islands is not an option. Instead each element of your CAD Standard must compliment the other elements of your CAD Standard. While I have always aired on the side of defining procedures outside of the CAD Standard, your standard will certainly imply numerous procedures. For instance if your file management standard is set up to have model files and sheet files, you are implying a workflow in which sheets are generated by xrefing model drawings. So what does all of this have to do with training? Oftentimes when developing a corporate training program we put our sights on the classroom. After all, learning happens in the classroom – right? Let me answer that question with yet another question. How much of your job did you learn in the classroom? If you’re like most, you learned a lot of concepts in the classroom, and then learned the procedures behind those concepts while applying them at your desk. Should this learning not be considered apart of your training program? If you have taken many Train the Trainer type classes you have likely heard the public speaking model of; tell them what you are going to tell them, tell them, and finally tell them what you told them. Both comprehension and adoption is a direct result of repetition. This brings me to the final element of The Training Trinity. What is another element we as CAD Managers have a hard time having our users adopt? Hopefully you answered CAD Standards. The Training Trinity is simply the was in which you define your corporate training program to include conventional classroom learning, end user support, and finally your CAD Standards. A training program is much like a CAD Standard in the way that neither can be constructed as a series of islands and be successful. Each piece needs to work in tandem with the next, and so on down the line. So how can this be done with training? I’ll see you next year at AU for the full explanation. Since that is a year away let me share some thoughts with you. Classroom training has well, broken outside of the classroom in the modern-day corporate environment. As deadlines become tighter, and budgets shrink, managers are less likely to send their users to training. How can this be accommodated? The answer here is not spend more time supporting users. Instead what we want to do is better educate our users and then support their questions as they try it out. E-learning is taking on a more integral role in the modern-day workplace. Much like e-mail revolutionized the way we exchanged information in the workplace, e-learning is teed up to be another paradigm shift in the way we learn at work. The reason is simple – it is becoming increasingly harder to commit a user to multi-hour or even multi-day training. E-learning affords us the opportunity to develop very targeted material which can be viewed on-demand by your users as they need the information. The result is a little less personal of a learning experience, but one where the user may actually retain more information as they are applying a certain concept immediately instead of days down the road. I mentioned a little earlier that even the best CAD Standard is likely to imply certain procedures. The last thing you want is to present this wonderful new procedure to your users, that come to find out is prohibited by your current CAD Standard. I once again emphasize the likelihood of implied procedures in your CAD Standard. 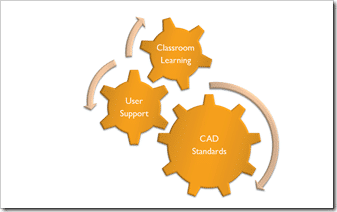 In CAD Management, perception is most often seen as reality. Consequently you as a CAD Manager cannot afford an oops moment where you present something and then have to recall it because come to find out your CAD Standard prohibits it. So what is the Training Trinity? 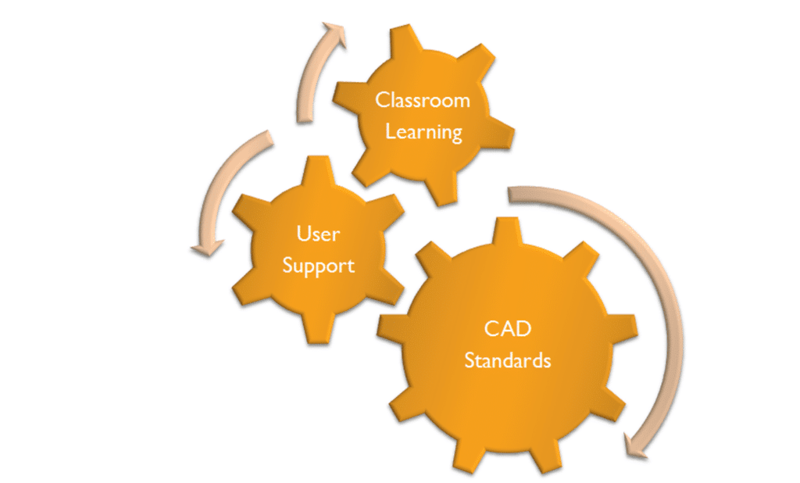 Quite simply it’s the way in which your classroom learning program, user-support system, and CAD Standard each compliment one another. The ultimate goal is to make these work together as one, not individually. Your training dollar will go much further if you work to integrate each of these together, as opposed to the more common model of addressing each one individually. Admittedly each of these elements have their own dynamics which must be addressed individually. The trick here is to insure such dynamics are addressed without breaking the link between the other elements. let me be your student. I need your hands on training.